This painting depicts a splendid sunset over Morro Bay as I looked out from Black Mountain toward San Luis Obispo. I was amazed by the color in the landscape and sky. The objective of this piece of work was to capture that moment in time and the elements that created this special event. 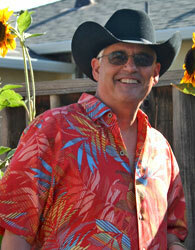 Allen Figone was born (1949), raised, educated and currently resides in San Jose, California. Allen went to San Jose City College earning an Associate of Arts degree in commercial art and then to San Jose State University where he obtained his Bachelor of Arts in painting in 1973 under the direction of John DeVincenzi (life drawing and painting), Wendall Gates (life drawing and painting) and Raymond Brose (illustration and technical/editorial design). Over the course of his life long career as an artist, Allen has won awards in local shows throughout the San Francisco Bay area such as the Los Gatos Annual Juried Watercolor Exhibition (Second Place), The Olympiad of the Arts (Santa Clara Art Association Award and Honorable Mention), and Los Altos Arts Alive (Award of Merit), the Alameda County Fair (Award of Merit) and the Redwood City Art Center Non Juried Exhibition (People’s Choice: Best of Show) to mention several. His paintings have been featured in galleries throughout California, Oregon, Arizona, New Jersey and Montana. Allen is currently represented by these fine art galleries: Christopher Queen Galleries, Duncans Mills, CA., California View Fine Art, Los Gatos, CA., and the Lee Youngman Gallery, Calistoga, CA. Admired by fine art connoisseurs, his work is proudly displayed in private collections throughout the United States, Canada and Europe. Most recently Allen has achieved National level recognition as a finalist in “ The Art of Seeing Nature” Oakland Museum of Art, “Arts for the Parks 2005 and 2006”(triple finalist), Jackson Hole, Wyoming, and “Oil Painters of America Western Regional Juried Exhibition 2006, 2007, 2008, 2009, 2010 and 2011. He also was a finalist in the 2008 and 2009 Oil Painters of America National Juried Exhibitions. The Grand Canyon Association purchased Allen’s painting “Drama Along Bright Angel Trail” which was one of two paintings that were finalists in the 2008 Paint the Parks National Exhibition Top 100. In 2009 and 2010 Paint the Parks he was again a multiple finalist with paintings in the Top 100 and Mini 50 as well. Allen was also one of 66 contemporary artists selected internationally to represent Zion National Park in “A Century of Sanctuary” The Art of Zion National Park, National Exhibition (in commemoration of its 100 year Anniversary), held at the St. George Museum, St. George, Utah. Allen’s painting “Afternoon Shadows” has now been added to the permanent collection of the St. George Museum. As an artist Allen has taken the skills he learned doing technical Illustration and combined that with what he has learned from studying the Early California Impressionists, which he has admired and studied for years, to create a unique style of painting to shape his aesthetic vision. “My painting philosophy is simple: to capture nature as I see her and to depict the colors and values I see as exactingly as possible. Art is about seeing, interpreting and painting the performance.